Sweetgreen is a fast-growing salad chain with some serious support from tech. The chain announced Tuesday morning that it has received an additional $US18.5 million in funding from Revolution Growth, an investment fund from AOL cofounder Steve Case and fellow former AOL execs Ted Leonsis and Donn Davis. Behance CEO Scott Belsky, Stonyfield Farm founder Gary Hirshberg, and restaurateurs Danny Meyer and Daniel Boulud also contributed to the round. 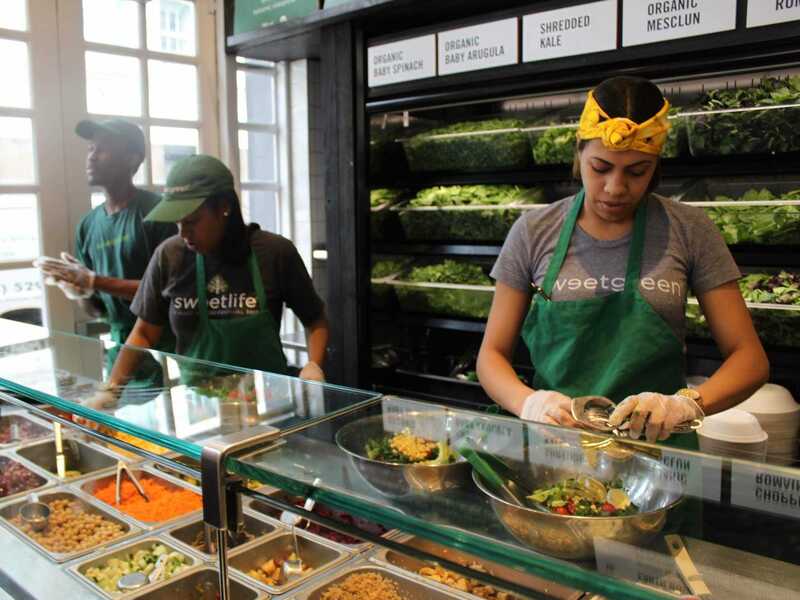 Sweetgreen had previously received $US22 million in venture funding from Revolution Growth in December of 2013, bringing its total to $US40.5 million. “The words ‘seasonality’ and ‘fast food’ are rarely used together, but at sweetgreen, we believe that the two don’t have to be mutually exclusive — it just takes a commitment to standing behind our food ethos and working with farmers that share the same values,” cofounder and co-CEO Nicolas Jammet said in a press release announcing the new funding. 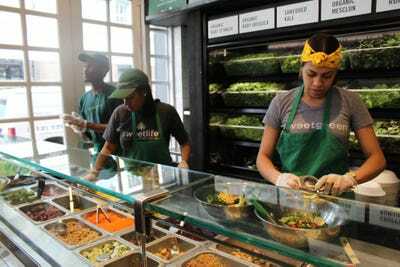 Sweetgreen currently operates 27 locations on the East Coast, and it plans to open stores in California next year. We recently visited a Sweetgreen restaurant in New York City to see if it lived up to the hype. 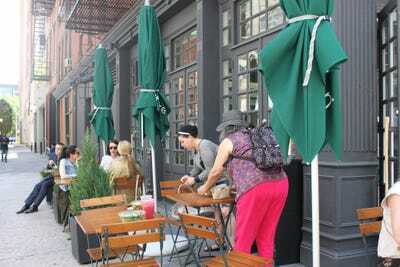 We visited the chain's brand-new location in Tribeca, which opened in May. By 1 p.m., the line to get food stretched down the block. For the most part, the crowd seemed to be made up of young professionals on their lunch break. 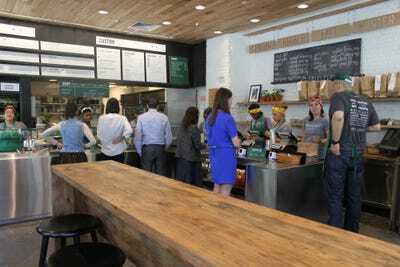 But Sweetgreen isn't just popular with the working crowd -- it has some cachet with hip youngsters, too. The company created this slogan, inspired by a song by rapper Kendrick Lamar, to appear on branded tees and tote bags. Kendrick Lamar was one of the artists to perform at last year's Sweetlife Festival, a music festival that Sweetgreen has put on annually since 2010. Lana Del Rey and Foster the People were headliners at this year's event. Some people were eating at tables outside. 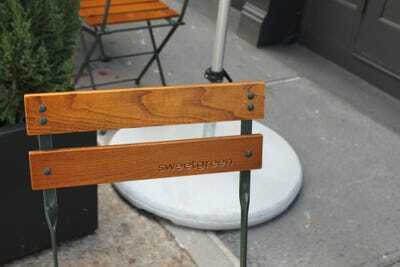 Even the chairs bore the Sweetgreen logo. Inside, the store was busy with activity. 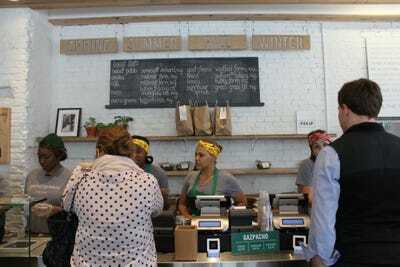 A chalkboard sign above the cash registers showed which local farm each of the day's ingredients came from. This location had one long table down the center, though some of the other locations have a larger dining area inside. The table is made of reclaimed wood, continuing the focus on locally sourced supplies. 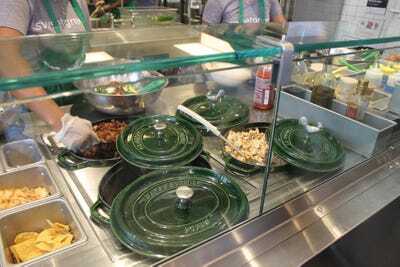 Once you're ready to order, you can choose from a selection of signature salads, or you can create your own. 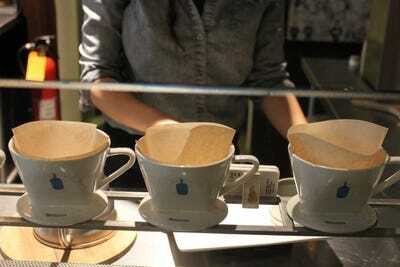 They also have rice bowls and a rotating menu of seasonal salads. All of the greens are out in the open, so you can see that they're really fresh. 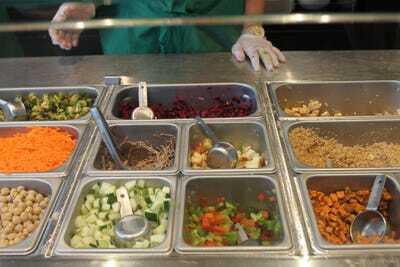 As you move down the line, you pick from a selection of ingredients. The freshness of ingredients was a major motivation for Revolution Growth's investment. 'Sweetgreen is quickly emerging as the place of choice for people looking for fresh, seasonal, and locally sourced food -- and in the process is building a lifestyle brand with meaning and purpose,' Steve Case said in a press release announcing the funding. At the end, you can choose what protein and dressing you want to go on your salad. The dishes looked amazing, too. Sweetgreen teamed up with Momofuku's Kaizen Trading Company to create this seasonal salad to be served in their NYC locations throughout the month of June -- it's made with kale, arugula, sunflower sprouts, roasted chicken, onions, carrots, cucumbers, mixed seeds, and basil. It's tossed with a dressing made from Sunflower Hozon, rice wine vinegar, agave, ginger, olive oil, and soy sauce. The Kale Caesar, one of the signature salads, is made of shredded kale, chopped romaine, roasted chicken, shaved parmesan, grape tomatoes, and parmesan crisp. It's topped with caesar dressing and a fresh lime squeeze. 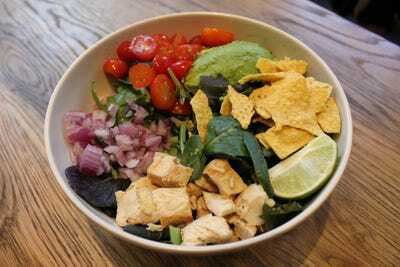 And the Guacamole Greens is an organic mesclun salad with roasted chicken, avocado, grape tomatoes, red onion, and crushed tortilla chips. It's served with a lime cilantro jalapeño vinaigrette and a fresh lime squeeze. 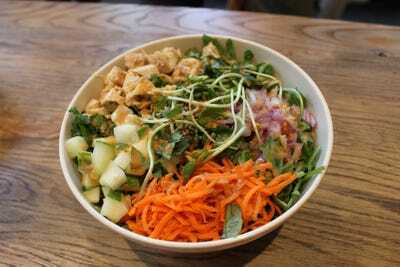 In our opinion, Sweetgreen salads live up to the hype. We went with the guacamole greens salad, and it was delicious, fresh, and filling. 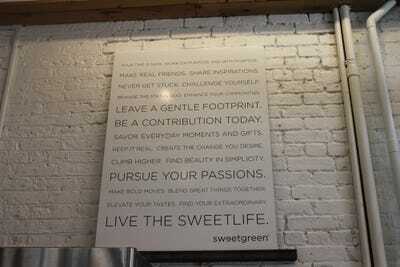 There's lots of signage explaining the spirit behind Sweetgreen. 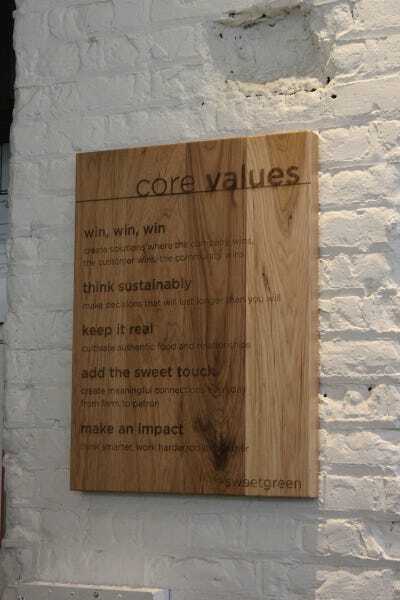 This sign behind the counter elaborates on the brand's core values. 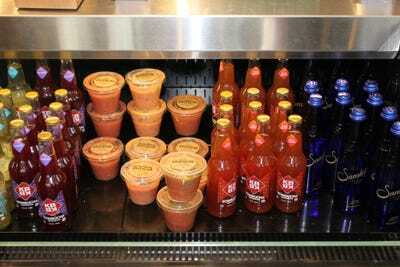 Below the counter there's a selection of juices and natural beverages as well as gazpacho, a cold soup that's perfect for the heat of the summer months. They also offer iced tea and lemonade. 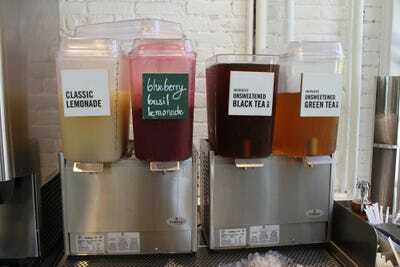 The blueberry basil lemonade is a Sweetgreen fan favourite. Sweetgreen has its own app that you can use to earn rewards and pay with your phone. Once you spend $100 through the app, Sweetgreen gives a percentage of each purchase to FoodCorps, a nonprofit that helps bring healthy meals to underprivileged schools. 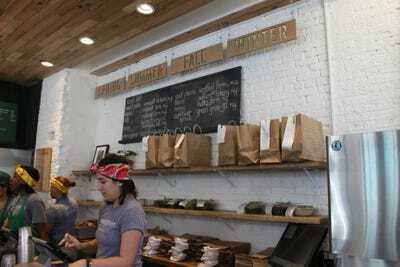 About 25% of Sweetgreen orders are made through the app, and the company will be unveiling an online-ordering system by the end of the year. The store was busy with customers, but there were plenty of takeout orders as well. The bags behind the counter were waiting to be picked up. 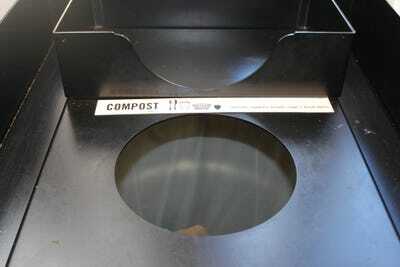 The store reminds you to think of the earth on your way out. 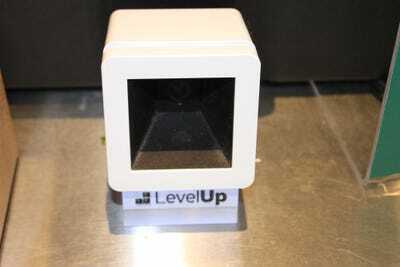 Now check out another place that tech investors love.